Is it possible for depression to have a good effect? Anger is considered as healing/needed. Can the same thing be said of this? I’ve been thinking about this for some time already. I think that at some point in time, every one experiences this feeling of extreme sadness coupled with strange emptiness. I know I have, not just once. Is it possible for depression to be healing? Is it possible to be a tool for recovery? Maybe once one focuses inwards, one will have the ability to understand his/her own emotions in such a way that s/he will be able to deal with it. Anyway, that’s just my thought. What’s yours? It’s true, I admit it. I do have escapist tendencies. There are times when I just want to go, run, and be free, free from rules, free from constraints, free from pain. I just want to breathe. I want to feel truly alive, without any restrictions, without anyone dictating. I want to experience that glorious moment of freedom, when all you can do is to feel the sweetness of the wind, all your senses alive. But I don’t do that. Because I know who I am and what’s expected of me. Duty first, of course. That’s always been the case for me, and I don’t think it’s going to change anytime soon. Is there even a way to reconcile these two together? Has anyone ever felt that their life is like hell on earth? I sometimes feel that way, which is pretty ironic considering that I’m very outspoken about my faith. It’s just that, there are times when you feel as though everything’s getting messed up. It’s not just a simple matter of crashing and burning; if it was just you, it would be better, because you’d know that you have to do something about it. It’s when the external factors come and affect you from all sides that you’d feel tortured. It’s not that I’m being emo or anything. It’s simply that sometimes, one does get tired. Just because you present a brave face to people doesn’t mean that it’s the same thing that you feel inside. I admit, it’s hard to reconcile both images: that of one who seeks to live by faith to that of one who is actively questioning, asking, puzzling. I don’t think there’s a problem though, because it is through asking questions that one finds answers. One of our goals is to seek Jesus’ face, to come to know Him deeper each day. If we don’t actively chase after Him, will we or will we not find Him? It’s a two-way thing, of Him reaching out and us looking. If we become contented with what we know, will that make us deeper in our faith? I honestly don’t think so. Instead, it makes us complacent and apathetic of who we are and what we are created for. Jesus said in His sermon that those who suffer are blessed (Matthew 5:1-12). Why? Because they already know what it’s like to feel pain, hence, also the ones who need healing? Because their lives have been filled with darkness, and need light? I honestly don’t know. All I know is that without Him would be despair. But it’s now 17 years later. I’ve gotten married. I have two kids. I’ve gained a few pounds. And I’ve gone from having never walked into a church to having 17 years’ worth of Sundays in church buildings. And with all that experience (not to mention the few extra pounds) under my belt, I can tell you that there is something very familiar about most of the Christians I’ve met. Unfortunately, it’s not that they remind me of the people who populate the pages of Scripture. Instead, they remind me of a little girl named Emily. Little Emily looks cute in her souvenir shirt that proclaims, “My parents went to Florida and all I got was this lousy T-shirt.” But there’s something sad about it too. She missed the journey. She didn’t get to take part in the adventure. While others broke out of their dull routine, Emily missed the excitement of doing something different. She didn’t get to play in the waves or hug Mickey. She didn’t get to experience the joy. Even the horrifying incident when the tire blew out and Stan, the self-proclaimed “Good Samaritan Redneck,” rescued the family in his Sanford and Son pickup truck has quickly become a fond memory for everybody. Everyone except Emily. She missed the journey. As I’ve gone to church and met Christians and lived as one myself, I’ve realized something. When I read about the lives of the first Christians in the pages of the New Testament I see people who actually went “on vacation to Florida,” who truly experienced the ups and downs of the trip. But when I look around at Christians today, I see people who just wear a T-shirt for an adventure they’ve missed out on. We’re missing the journey. We’re stuck in the same dull routine. We’re missing out on the joy and fear and laughter and doubt and mystery and confusion of following Jesus, of taking great risks for God, of praying dangerous prayers, even of being spiritually attacked. The more honest among us find ourselves asking questions like: Is this all there is? Is this really what Jesus meant when He said, “I have come that they may have life, and have it to the full”? Is this the life Jesus died for me to have? Didn’t Jesus pay too high a price to buy me this life? Am I just supposed to be miserable until I get to heaven? I think the word that best describes how many feel about their Christian lives is not abundant, joyful or purpose-driven, but disappointing. And when I met Christians for the first time as a sophomore in college, I was disappointed. I was disappointed at their disappointment. And I swore I would never be like that. Over the years I have, at times, descended into the world of the “T-shirt wearers.” I have found myself going through the motions. I’ve lost my purpose and passion for so long at times, I had to put them on the back of a milk carton. In honest moments I’ve asked those same despairing questions. I’ve been disappointed. And I’ve wondered if maybe God is the problem. I mean, He does want everyone to say yes to His offer. And if someone is trying to sell me a new car, vacuum cleaner or cell phone, I don’t expect them to be completely honest. They’ll exaggerate the benefits, ignore the problems. It may still be a great car, vacuum or phone, but I’m not getting the whole truth, and I know it. Maybe God is like that. The benefits He claims to give to those who say yes to Him include abundant life, pure joy in the face of trials, peace that surpasses understanding, power to heal the sick with our prayers, assurance that we will never be tempted in a way we can’t handle, fearlessness and the promise that we will do greater things than Jesus did. How many Christians would say these things are a good description of their lives? More personally, does it describe yours? So maybe God is the problem. Perhaps He’s just a master salesman. After all, he’s good at everything else. But I don’t think so. Actually, I think we’re the problem. And I think there’s a solution. I think we need to go on vacation. I love vacation. And, when I’m really living it, I love the Christian life. It’s helped me to approach my days with a sense of anticipation, and it’s allowed me to break out of my routines and experience adventure. But, like a vacation, following Jesus is not a perfect life of nonstop thrills. There are some boring and bad parts. But still there’s something different about them, simply because I’m following Jesus. So why are so many Christians disappointed? Is it possible that we, like Emily, are missing out on the journey? Is Jesus calling us to live life with authentic spiritual passion, but we’re just wearing the T-shirt, practicing a souvenir religion? Jesus asks people to follow Him. He’s going somewhere, and He wants us to go with Him. He promises that those who follow will experience life fully alive. To live life with Jesus, and to live the Jesus life. To live life with Jesus is about the inward life. It’s me experiencing the presence of Jesus. It’s soaking in all of Him that’s out there. It’s God impressing Himself on me. It’s God changing me. To live the Jesus life is about the outward life. It’s me being the presence of Jesus. It’s releasing out all of Him that’s in here. It’s God expressing Himself through me. It’s God changing the world with me. Since moving to Virginia Beach, I’ve developed allergies. Recently my wife bought a humidifier for our bedroom. Each morning I have to fill the thing up with water, and the rest of the day it releases that water into the air. I’ve learned that the humidifier can be turned on and running hard, but it accomplishes absolutely nothing if it’s not filled with water. The Christian life is something like that humidifier. I admit it’s a simple analogy, but it helps convey the give-and-take there is in following Jesus. Repeatedly I need to be filled up with Jesus (which happens as I live life with Jesus), and then I need to continuously release Jesus (which happens as I live the Jesus life). I release Jesus because my purpose is to serve others, to touch them with God’s love. But I can only do that if I’m filled with Jesus. Otherwise I can run hard, but I won’t accomplish anything. We’ve been invited to live life with Jesus and to live the Jesus life. To do that, we need to understand what it means and overcome what holds us back. Then we can lose the T-shirt and experience the adventure. Oh man. This hits hard. I’m at this point in my faith that I’ve been struggling because of the situations that I’m going through right now. It’s quite tempting to cut off God when you’re pressured. “God can wait, but this can’t!” “Oh, wait, I have to do something. I’ll let go of my prayer time for now, so I can finish this paper.” “Guess I’ll hold off on reading the Bible, since I have an important meeting, anyway, I’ve read it three times already.” It’s so easy to hold off on Him. It’s hard to imagine that God can be bigger than the situation that we’re in right now. It’s the truth, though. He is bigger, and He has already defeated all that oppresses us. I know. It sounds like I’m giving platitudes, but I’m not. I’ve encountered first hand what it means to fall. There are times when I’ll put my time with Him aside because there are some things I’m busy on. Pretty soon, I’ll realize that the one day/one week time I’ve promised has already progressed to a month of no prayer, no Bible reading, no personal encounter with Him. I’d still go to church, of course, but there’s something missing. That one-to-one relationship I enjoy with Him isn’t there, and I feel it. It becomes an ache, an emptiness in me, that at first becomes undefinable, but as time progresses, it becomes clearer. It’s not that He was absent, but that, subconsciously, I was keeping myself away from Him. Some say that the hunger, the thirst is a sham. Not true. After knowing Him, I don’t think I’d want to go back to the old life: with me not knowing Him. That’s not even something I want to contemplate. Where is “faith” in faithfulness? The latter means devotion, continually sticking to something or someone no matter what. It also means continued belief. It’s about living for Someone who gave Himself to you, not for anything else but because you know it’s the right thing to do. It’s about knowing and believing that you’re part of the greater plan. It’s about knowing that there’s Someone who loves you for everything you are, no matter how unfaithful, cruel, miserable, depressed, or upset you’ve been. Let’s not drop out of the race. It might be tempting to do that, when things become tough, but it’s just going to get worse if we do so, because then, we wouldn’t have anyone on our side. Reflect in Vincent’s eyes of china blue. Are soothed beneath the artist’s loving hand. With eyes that watch the world and can’t forget. They would not listen, they’re not listening still. Two different forms of media form together. It’s quite interesting, because while the song was written years after the painting was made, it created this bond between the two. One cannot look at the painting without thinking of the song, and of Vincent Van Gogh’s life. Postmodernist thinkers and critics say that in art “the writer/artist” is dead, but in cases like these, does this still apply? I find it sad that people would so readily reject the true meaning of Easter (and the entire Lent season, for that matter) these days. Nowadays, it’s all about rabbits, eggs, and parties. Don’t get me wrong, I’m not saying that you should get rid of all these, get rid of the fun factor. Hey, I’m a fun-loving gal in my early 20s. I just find it wrong that people forget so easily. There’s this line in “The Lord of the Rings: The Fellowship of the Ring” (the film version) at the beginning, when all you can here is Galadriel’s voice talking about the history of the ring. She said, “And some things that should not have been forgotten were lost. History became legend, and legend became myth.” I don’t think that most people have forgotten what Easter is truly about, not really, but they just conveniently put it at the back of their minds in favor of the more “popular” ones. The thing is, though, not everything that’s well-known is better. You only have to look at wars to prove that. Let’s not “Hallmark”-ize holidays no more than we have to. When you get down to it, Easter is about the resurrection of Jesus Christ, the One who died for us, and who rose again from the dead, also for us. Heck, it is also His life that we also celebrate during Christmas. It is His love that we are celebrating, and not the number of colorful eggs that we can collect. Please let’s not forget that, because that is the plain, simple, yet meaningful truth. Know Him. Love Him. Worship Him. 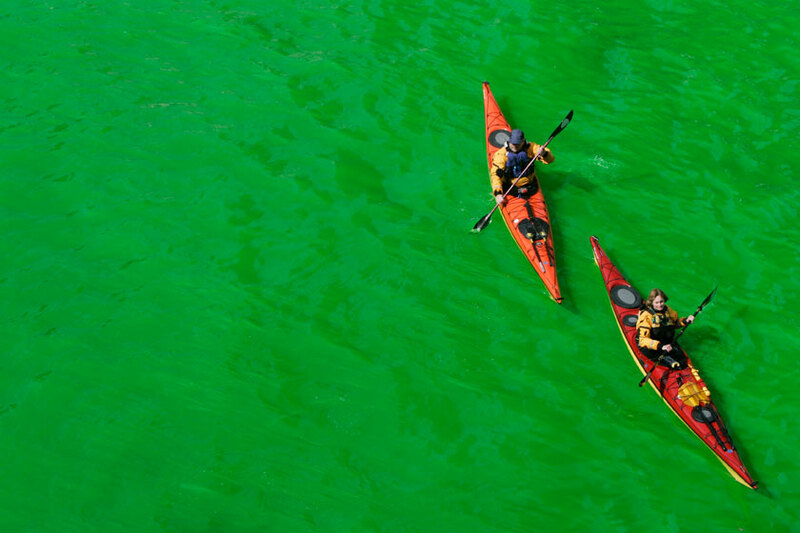 The Chicago River is dyed green every year on St. Patrick’s day. Interestingly, the applied color is actually orange, but when it reacts to the water, the result is a bright green shade that lasts for several hours. In religious aspects, the day serves to commemorate St. Patrick, one of the patron saints of England. It is, in fact, a holy day of obligation for Irish Roman Catholics. The tradition has seeped through to mainstream culture, such that people, Irish and non-Irish, wear green on March 17 in honor of the event, as well as eating Irish/green food. Parades are also given, not just in Ireland, but in the US, Canada, Australia, as well as a few other countries. Interestingly, Wisconsin changes its name to “New Dublin” the week of St. Patrick’s Day. All I can say is, I just hope that they don’t really commercialize this day so much. Like other holidays, it is rooted in Christian tradition, and it’s going to be a shame if they’re going to turn it into a Hallmark holiday, if it isn’t already. Whoa. That’s one thing I can say about this picture. Whoa. It captured so much in just one shot, without being too busy. I have no idea how the photographer was able to get this image, but whatever technique he used, I’m amazed. For some reason, Eden comes to mind when I see this picture. I know, I know, it doesn’t really follow how it was described, not completely anyway, but there’s something about it that strikes me. Maybe it’s the hint of lushness of the picture. Maybe it’s in the richness of color. Maybe it’s the thought that the sunrise evokes - a new beginning. I really don’t know, but it’s something that my mind sees. It’s beautiful, really, considering that something like this exists in our world. Here are more pictures from my friends’ birthday party. This time, I’m posting images taken at the restaurant where we had our dinner. It was a quaint Italian restaurant, really small but very comfortable in, and the attendants were pretty nice, so it was a good place to have a meal in. I couldn’t resist taking a picture of the glass, because I loved the shape of it. Here are their desserts on display. All of these look very yummy, especially because they had nice presentations. Sorry for the poor quality, I think the glass reflected the light, causing the glare.